Bruce Arians is downplaying any revenge factor against the Steelers. 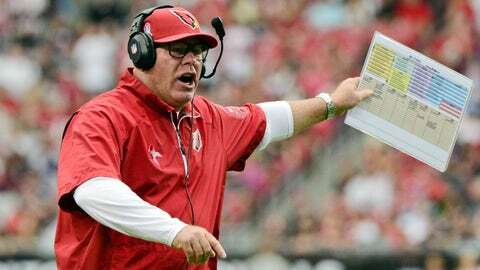 Arizona Cardinals coach Bruce Arians insists there’s no special significance to facing the team that cut him loose in January 2012. “It’s just another game on the schedule,” Arians told reporters in advance of Sunday’s matchup at the Pittsburgh Steelers, the team with which he spent five seasons as offensive coordinator before, according to the company line, he decided to retire. Weekly reminder that the Steelers "retired" Bruce Arians. Arians has made no secret that he was kicked to the curb by the Steelers and of how it turned out to be the best move of his career. He was quickly scooped up by the Indianapolis Colts, first serving as offensive coordinator and then interim coach – a springboard to his current job with Arizona. "He’s so focused on this team and this year and not years past,” Cardinals quarterback Carson Palmer said. “Obviously, going back to a place where you worked before, there is a little extra on it. But his focus is so on this team … where we need to improve and things that need to be fixed and coached. Steelers coach Mike Tomlin, who eventually acknowledged he made the call to change offensive coordinators, said he doesn’t think Arians will be putting any emphasis on Sunday’s game. One of Tomlin’s top players, star receiver Antonio Brown, is not so sure. “Knowing him and how competitive he is, I’m sure he’s going to want to come in and put on a show, seeing how many people counted him out and wanted him out of here,” Brown said.